When putting this countdown list together I tried very hard to ONLY base the covers selection/ranking on the merits of the cover image as ART. I tried not to base it on my own LOVE of the issue/storyline it represented. I tried not to allow nostalgia or love for a series/character to color my ranking. Sadly I’m sure I have failed in a few instances and this is probably one of them. I do really love this cover though it’s dynamic and wildly horrific. I always loved the short-lived but more colorful costume Val is wearing here. Dr. Strange’s disciple/GF Cleo made it for here and she wore it for a few issues and then eventually reverted back to her old Asgardian blue/black thingie. I always liked this one more even if it did have less skin! Anyway it’s a great cover but for me it brings back even greater memories of one of the earliest comics story-lines I read when I was 10-11 years old. 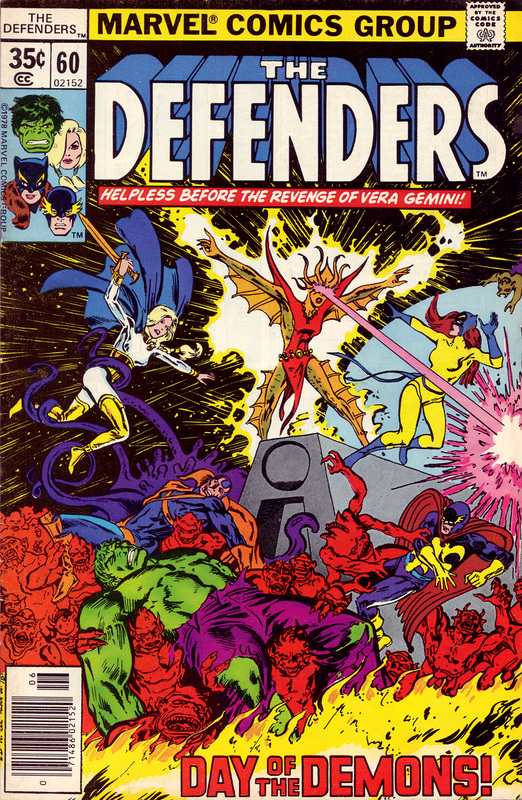 In writer David Anthony Kraft’s “Xenogenisis” arc (issues 58-60) the Defenders battled Vera Gemini and her demon hordes who wanted to replace all of humanity on earth with nasty demons! At one point even Dr. Strange gets possessed/absorbed by the demons! I remember staring at this cover a LONG time sketching my own versions of the monsters. Check back in tomorrow night for more in the count-down of my Top 100 favorite comic book covers. This cover doesn’t do much for me. I was never a big fan of the white and gold for Val. This storyline also didn’t wow me. I preferred when DeMatteis was writing the title. Or Gerber. Gerber was awesome.